Women’s Quarterfinals Exit Survey: Which Teams Went Out And What’s Next For Them? Coverage of the Women’s Division of the 2018 D-I College Championships is presented by VC Ultimate as part of their season-long support of our women’s coverage. All opinions are those of the authors. Please support the brands that make Ultiworld possible and shop at VC Ultimate! Four more exceptional teams eliminated from the competition. But making the final 8 is still an impressive achievement, especially with how hard they fought to make the bracket. In our Exit Survey segment, we’ll be looking at the performances from these four teams, answering five key questions about their season and their performance at Nationals. How Did They Get To Quarters? Oregon’s season was not without speed bumps. Despite finishing with a record of 29-7, Oregon only made it to tournament semis once during the regular season and never made it to the finals of a tournament until Sectionals. But none of these losses were against weak teams. Oregon were frequently faced strong teams in quarters. Oregon’s biggest game was against UBC in the finals of Northwest Regionals, where Fugue finally beat their in-region rivals 15-13. Their success from Regionals was short-lived. In their very first game at Nationals, Oregon suffered a shocking loss to North Carolina State and were scrambling to stay alive in the pool from that game onwards. A close loss to Stanford and confident wins over OSU and Cornell brought them back into the bracket, and gave them a little bit of breathing room for their final game on Saturday. Against Tufts, Oregon showed the full extent of their power, remaining in control of the game from start to finish. They went up two breaks early in the game and never lost the lead. It seemed as if Fugue had finally found the intensity they were lacking in their first game against NC State. While they managed to retain that intensity for their game against Pittsburgh early on Sunday, the Fugue women ran into another problem. After two full days of ultimate under the hot sun, Fugue’s energy reserves were completely spent. They were already the team with the smallest roster at the tournament, and their lack of subs forced tired legs to stay on the line. With every break that Pitt earned, Oregon’s energy continued to fade. This is not to say that Oregon went down without a fight. Fugue continued to apply pressure on Pitt even after cap went off. What Was The Highlight Of Their Tournament? Oregon’s victory over Ohio State was a masterclass in offense after the turn. With every mistake OSU made, Oregon aggressively drove the disc downfield and converted more often than not. Players like Sarafina Angstadt-Leto and Emily Fagan were instrumental in Oregon’s win and they should be proud of their performance. Oregon needed to beat OSU by four points to qualify for the bracket, they ended up blowing Fever out by six. Who Stood Out For Them? Morgan Caldwell. While Hayley Wahlroos and Ella Hansen were Oregon’s true stars, no one seemed to work harder on the field than Caldwell. Everyone on Oregon played both ways, but while many players had obvious preferences, Caldwell was a menace on defense and a reliable downfield option on offense. Caldwell also seemed to have unending endurance. She kept churning long after many of her teammates slowed down. Oregon’s 2019 will be defined by their new recruits. They lose four seniors and will retain most of their core, but that’s still less than two full lines. Luckily, the pipeline for Fugue remains strong. They have a few incoming rookies from around the nation that are already known players in high school ultimate and will be able to contribute from the offset. Fugue will definitely be in the running for Nationals next year, but their depth will determine how far they go. For a team that was supposed to be in a rebuilding year, Texas looked like a team in their prime. In their first tournament of the season, Texas upset a strong Oregon team on double game point and let everyone know that they could still play at the same level they had in 2017. When the season ended, Texas posted a record of 24-8, but continued to play better with each tournament. At Nationals, Texas tore through UCSD and the rest of their pool to claim the first seed and get a bye through to quarters. During pool play, no opponent got within four points of Melee, and they attacked the deep space with reckless abandon after every block or turnover. In a quarters game that seemed predestined, Texas met their South Central rival, Colorado Kali, in a rematch of the 2017 semifinals. Texas had already bested Colorado in the South Central Regional final, but Kali showed an endurance and energy this weekend that they lacked in April. Texas could not slow down the Kali offense and their once aggressive offense couldn’t generate the same intensity that they showed during pool play. Colorado closed out the second half with gritty defense, taking full advantage of Texas’ mistakes and unforced errors. Texas set off fireworks early on this weekend with their dominant victory over UC San Diego. Texas acted like they were the better team from the beginning of the game and had the plays to back it up. Every time UCSD turned the disc, Texas was there to make the Psychos pay for it. This led to UCSD overthinking their offense and looking off safe passes out of fear. For a team that cut their teeth on defense, Texas proved that their offense was just as formidable. Domenica Sutherland. Teams that live by the Sutherland, die by the Sutherland. When she was locked in, Sutherland was an unstoppable hurricane, tearing through defenses and coming up with highlight-worthy stops. She posted 13 blocks, 25 assists and 8 goals, all during pool play. In her fourth year on the team, Sutherland became the focal point for Texas. It earned them a spot in quarters. Reply hazy, try again later. At the beginning of 2018, we were convinced that it would be a rebuilding year for Melee. Their performance at this tournament stands in direct contradiction to that take. So even though we’d like to say they’ll be rebuilding after losing a strong core of seniors, Texas may still find a way to surprise us. Perhaps even enough to make the bracket again. UNC posted the best record of any team this season at 27-1, enough for a 96% win percentage. Not even Dartmouth can claim that distinction. Coming into the postseason, UNC remained dominant and easily won their conference and their region. It was only at Nationals where UNC ran into their first sign of trouble. Losing to Pittsburgh in pool play caused UNC to fall to second in their pool, forcing them to play a prequarters game. They handily defeated Michigan, which set them up for a brutal quarterfinal against Stanford. Stanford Superfly handed UNC the loss that sent Pleiades home, but Pittsburgh Danger help set that game up. Sending UNC to the prequarter round forced them into an extra game before having the misfortune of playing a quarterfinal against one of the most experiences teams in all of college ultimate. In their game against Danger, UNC went up early in the first half and looked to close out the game with their unchallenged offensive unit. This all changed dramatically in the second half. Pittsburgh’s offense found its feet and the defense ramped up their pressure on the cutters. Suddenly, UNC handlers were in danger of stall outs and risky reset passes. Just like that, Pitt tore the game away from them. Normile and Co. played perfectly on offense and put pressure on UNC’s offense to be mistake-free. UNC still remained ahead until the final three points, in which Pittburgh pushed them back with sharp person defense and caused UNC to overthink their throws. Stanford’s zone defense prevented UNC from playing their preferred offensive structure, and they made UNC pay for every mistake. Within the first few points, UNC was playing more conservatively than they had all year, and it didn’t help. Stanford was patient in every possession and wore out UNC in the first half. Not much changed in the second. UNC’s impressive run this year was ended by Stanford’s efficiency. They aren’t the first team to lose in this manner and they certainly wont be the last. UNC thrashed UBC during pool play. You wouldn’t be able to tell that UBC was the second seed in the pool off that game. UNC seemingly came down with every 50-50 disc and posted blocks across the board. Naomi Morcilla was the only star from UBC that had any meaningful contribution, which is very telling considering how many stars UBC has. It was exactly the type of game UNC wanted to bring in their first game of the tournament. Jenny Wei. Until UNC lost to Pitt, Wei looked like the best player at the tournament. She was effective at every position and denied the deep game from every team Pleiades went up against. She posted 18 goals, 16 assists and an astonishing 24 blocks! That’s the statline of a Callahan finalist, no doubt. UNC is only going to get stronger. The Triangle is producing some of the best youth ultimate talent in all of America. With how many of these young stars have already pledged to play for Pleiades, they’re going to remain a powerhouse in the division for years to come. UBC started their season later than most of their competition. The Stanford Invite was their first tournament and that was all the way into March when most teams got going a month earlier. Still, for starting their season so late, UBC came out the gates firing. They made the finals in Stanford, and had dominant games over most of their competition. With a final record of 19-5, UBC may not have played that many games, but they did enough to earn them a second seed in pool C.
Milwaukee was another story for UBC. 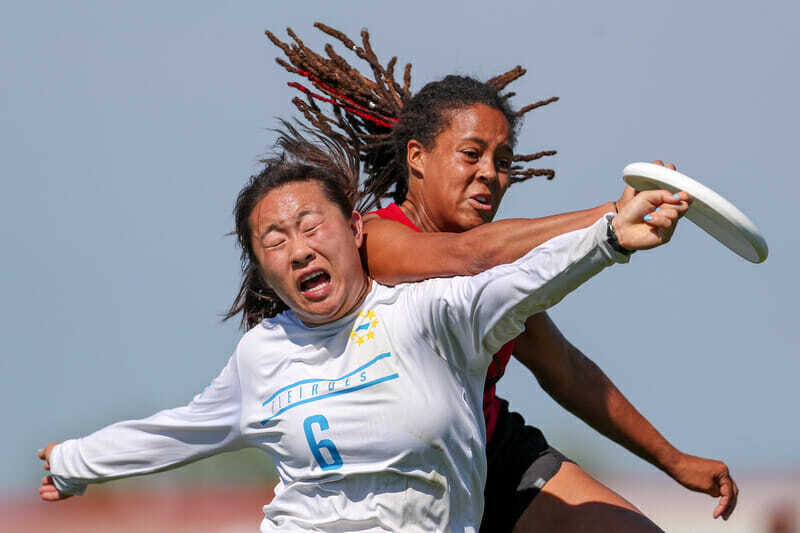 Their first game of the weekend ended in an awful loss to UNC, where the thunderbirds seemed out of sync and played too loose with the disc. Even their wins were tighter than they had to be. Both Whitman and Florida played close with them early in their games. UBC had to dig deep to earn their wins over these lower seeded teams. Ending pool play with a loss against Pittsburgh was not part of their plan, either. UBC was up for most of the game and were caught off guard when Pitt came back for the win. That dropped them to 3rd in their pool, setting up a tough game against UCSD. The UCSD game was the first time that UBC really lived up to the potential of their roster. It was their energetic defense and fast tempo that put UCSD on the back foot, giving UBC the advantage for most of the game. They took half easily, and even a late game surge from UCSD was not enough to topple the Thunderbirds when it mattered. UBC’s reward for beating UCSD was getting to face Dartmouth in quarters. Princess Layout was ready for the Thunderbirds and the game was over by half. UBC went down early and could never recover. Despite having so many strong offensive players, UBC was not disciplined downfield, which led to many unnecessary turnovers. Dartmouth was too efficient and too smart on defense. After going up 8-3, Dartmouth’s win in the quarters was all but inevitable. UBC’s best game was definitely their prequarter match against UCSD. This was very much a revenge game for the Thunderbirds, as the Psychos had dismantled them in the finals of the Stanford Invite. At no point during that game did it seem like UCSD was going to win. UBC went up early in the first half and played their best defense of the tournament. Naomi Morcilla. Even in the games that UBC lost, Morcilla played with an intensity and energy that transcended the rest of her team. She never seemed tired and was willing to throw her body around to grab the disc at will. Morcilla also took the toughest defensive assignments and was the first target downfield after the turn. Her impact for UBC cannot be understated. UBC always attracts a large number of Canada’s best youth players. That being said, the majority of their roster is made up of seniors, so UBC will likely lose a lot of talent this year. it’s not out of the question that 2019 will be a rebuilding year for the Thunderbirds. Comments on "Women’s Quarterfinals Exit Survey: Which Teams Went Out And What’s Next For Them?"